Jed Jacobsohn/Getty Images Rafael Furcal, shown hitting a home run today, leads NL shortstops in on-base percentage (.382, minimum 200 plate appearances). Playing nice defense, swinging the bat great: Rafael Furcal. According to Fangraphs, Furcal is also third behind Tulowitzki and Ramirez in Wins Above Replacement. Vicente Padilla’s ERA is 3.26 since returning from the disabled list. 1) Vicente Padilla: seven innings, one run, four baserunners, five strikeouts, 98 pitches. Not sure why he didn’t come out for the eighth inning considering the state of the Dodger bullpen — does he need more rest than Ramon Troncoso — but still good on him. 2) Red hot Rafael Furcal: three singles and a homer. 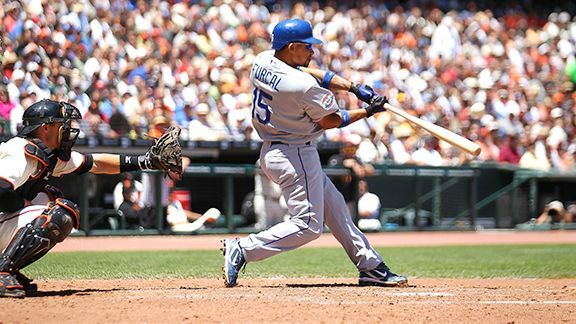 In his past five games, Furcal is 14 for 21 with three walks and a slugging percentage of 1.000. 3) Jamey Carroll: single, double and two walks. 4) Matt Kemp: two singles, a walk and a homer, continuing the hot streak that began Saturday (6 for 11 with three walks, .909 slugging percentage). Matt Kemp went 2-for-4 Tuesday with two running catches in his first meaningful game action since Saturday. Matt Kemp happens to be represented by an agent, Dave Stewart, who made a reputation as a player as someone who took the game of baseball very seriously. 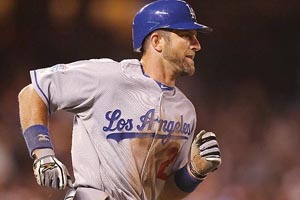 In an interview with Dodger Thoughts this morning, Stewart made no bones that it has been a struggle for Kemp the past two months, but expressed confidence that the experience has helped Kemp grow and, having cleared the air with Dodgers manager Joe Torre before Tuesday’s game, that he’s ready to turn a corner. Stewart said that the critical radio comments by Dodgers general manager Ned Colletti in late April, at a time when Kemp was hitting at an All-Star level, didn’t go unnoticed, but that they weren’t an excuse for Kemp’s play in recent weeks. An MLB.com report that Kemp had “a disagreement … with a member of the coaching staff in the dugout while discussing a game situation Saturday,” combined with Torre’s on-the-record comments Tuesday that he wouldn’t have necessarily put Kemp in the starting lineup for today’s game if Kemp hadn’t approached him, makes it seem logical that Kemp’s benching was related to a clubhouse issue. Stewart was limited in addressing that, but emphatic that Kemp is not taking things for granted. “The truth is, whatever it is that has taken place with the coaching staff and with Joe, my guess would be that those things are going to be behind [Kemp],” Stewart said. “I’m not at liberty to talk about what goes on in that capacity. That would be something I’m sure that if Matt wanted to talk about it, he would have, and he didn’t. “Joe is the manager,” Stewart added, “and with that comes a lot of responsibility for 24 other guys, which Matt and I both understand, which is also the reason Matt has really had no outward complaints toward what Joe has done. Stewart said that Kemp will continue to work with Dodgers coach Don Mattingly on his hitting, but also implied that he needs to tune out some other advice so that he doesn’t get overwhelmed. “I’ve never seen him ever not open to instruction,” Stewart said. “You have to be careful when things are going bad to being open to too much instruction. There’s a fine line in there. What I’ve learned in this game is that people have a way of feasting on other individuals when you’re in a weak moment. Matt’s smart enough to understand what’s helpful and what’s not, [but] in this game, when you’re in a down period, getting opinions and instruction from everyone can be worse than no instruction at all. Stewart also claimed, in what might be an unpopular viewpoint, that even though the 25-year-old Kemp has now been in the majors for most of the past four years, his baseball youth remains a factor. “I can tell you from my own experience, it took me until I was 28 years old to get an idea of what I was doing in this game,” Stewart said, “and I consider myself to be a guy who played baseball for a long time, from 7 years old. “I’ve read that we can’t use youth as an excuse. I think when you haven’t played a game for a long period of time, or as long a period of time as some of his teammates, there are still going to be some things Matt is going to learn about the game and learn about himself. There is no physical issue to explain Kemp’s struggles that Stewart knows of. So while Kemp remains a work-in-progress, there is reason to hope that the worst is behind him for now. Dodgers at Giants, 12:45 p.m.
Manny Ramirez is scheduled for an MRI in Arizona on Thursday, the Dodgers announced, saying that it hasn’t been determined whether he will go on the disabled list. Garret Anderson, who turns 38 today, is starting in left field, while Reed Johnson is giving Andre Ethier a rest in right field. Adrian Beltre is the subject of an appreciation by David Golebiewski of Fangraphs. John Ely walks the occasional batter now, and Elymania has died down, but with everyone’s attention elsewhere, he is back to doing the job. After a 30-pitch first inning in which he walked two and gave up a double and a run, the rookie righthander stymied the Giants in pitching the Dodgers to a 4-2 victory Tuesday. 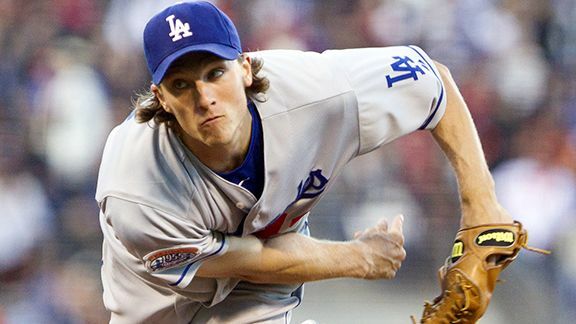 He went six more innings, allowing only five more baserunners and no runs, giving the Dodgers a much-needed lift. Ely pitched his second consecutive game of seven innings and one earned run, lowering his season ERA to 3.62. James Loney was another hero, twice giving the Dodgers the lead with an RBI single in the first and a two-run single in the fifth. Rafael Furcal (3 for 5 with a triple) and Russell Martin (2 for 5 with two steals) were the main tablesetters for the Dodgers, and Casey Blake had the other RBI. With Jonathan Broxton, Hong-Chih Kuo and Ronald Belisario all designated for rest after heavy workloads in recent days, the Dodgers had to regret some missed opportunities to put the game away. They stranded Furcal at third base with two out in the sixth and left the bases loaded in the seventh. But in the eighth, Ramon Troncoso got two outs, gave up a single, and then George Sherrill came in and had what had to be his best sequence of the season, going 1-0 on Aubrey Huff and then striking him out on three perfect breaking pitches – Sherrill’s first strikeout since May 17. San Diego lost again, allowing the Dodgers to close to within three games of first place in the National League West. Matt Kemp, who came off the bench in the first inning after Manny Ramirez’s injury, fouled out, struck out and singled twice in four at-bats, while making two more long running catches in center field. Both catches came on full sprints after slow reactions, but that’s basically how Kemp did the job in center all last year. Johnson went 0 for 4, striking out three times for the second consecutive game, matching Kemp’s feat from Thursday and Friday last week. Tony Jackson of ESPNLosAngeles.com has more on the Kemp drama. Jason O. Watson/US Presswire Joe Torre leaves the field with Manny Ramirez after the outfielder’s injury. Ramirez was initially listed as day to day, but there was no immediate word as to the nature or severity of the injury. Ramirez, who had singled up the middle with two outs, went to second on a subsequent single by James Loney that scored Andre Ethier from third. But Ramirez then inexplicably rounded second base and wandered three or four feet toward third even as the throw from Giants right fielder Aubrey Huff came to shortstop Edgar Renteria, who was standing on the second base bag. Ramirez then made a feeble attempt to get back as Renteria applied the tag, but the ball popped out of Renteria’s glove as second base umpire Ron Kulpa was calling Ramirez out, causing Kulpa to change his call. Ramirez was on the disabled list earlier this season with a calf strain in the same leg. Xavier Paul, who had a .328 on-base percentage and .404 slugging percentage when called up earlier this season, has continued his banner season with Albuquerque (.402/.633). Matt Kemp is benched for the third game in a row. 1) Torre and Kemp talked. 2) Torre told Kemp he would start Wednesday. 3) Torre said Kemp is struggling and has been frustrated. 4) Kemp came to see Torre; Torre did not approach Kemp. 5) Torre said he didn’t know if Kemp would be starting Wednesday if Kemp hadn’t come to him. 7) Torre said Andre Ethier would probably get a day off Wednesday. Whether Manny Ramirez will start Wednesday has not been determined. 8) Hong-Chih Kuo and Jonathan Broxton are resting tonight and Ronald Belisario is doubtful. The team will improvise its relief in the late innings. If a smile is Matt Kemp’s umbrella, it’s not keeping out the June gloom. 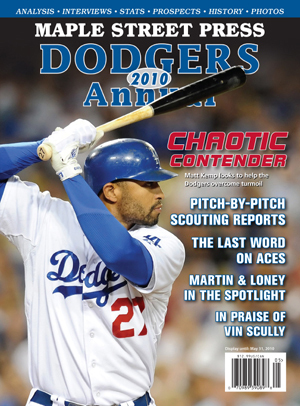 Three months ago, Matt Kemp was a 25-year-old reigning Silver Slugger and Gold Glove winner — a Dodger cover boy. Two months ago, Kemp was overcoming some uncharacteristic defensive and basestealing lapses with a career-high .570 slugging percentage, to go with a respectable .346 on-base percentage. Since that time, Kemp has fallen so far from grace that he has been benched for two consecutive games and become the subject of such furious trade talk that his long-running bandwagon must have come with an ejector seat. Branch Rickey’s credo to “trade a player a year too soon rather than a year too late” has been taken to absurd lengths in this day and age. When applied to younger players, you run a much greater risk of trading a player 10 years too soon. As is the case for all major leaguers, you could never say never to a Kemp trade. There’s a fair deal for Albert Pujols or Steven Strasburg somewhere in this universe. But any trade of Kemp would have to make sense. And chances are, if you feel Kemp is a lost cause right now, you are not going to make a good trade. Kemp’s .579 OPS in June is only his second month with an OPS below .750 since June 2008. Baseball is fundamentally about adjustments. Kemp has needed to make them before and did so in becoming an elite center fielder last season. There isn’t enough reason to think he can’t make them again. If Kemp is meant to end up like this decade’s version of Juan Encarnacion, if he is going to fade like Russell Martin, it will be because Kemp isn’t physically up to the task. It will be because, as Phil Gurnee of True Blue L.A. fears, Kemp is somehow slowing down before his 26th birthday. It will be because his reactions are going downhill. It won’t be because he doesn’t care. He didn’t get to where he was two months ago by not caring. And ultimately, the risk of Kemp becoming an average outfielder is still outweighed by his potential. After OPSing .880 in April and .837 in May — compared with the .842 in 2009 that satisfied pretty much everyone — Kemp is at .579 in June. This is his first month with an OPS below .600 since his rookie year, 2006. It’s only his second month with an OPS below .750 since June 2008. His performance this month is so clearly an aberration that Kemp really does have every right to feel insulted by the doubters. And no doubt, after his rest day Sunday (following two walks, a double and a marathon running catch Saturday) turned into a punitive benching Monday, insulted is probably just how he feels. The guy needs to get better, but he should be allowed to have at least some pride in his past performance. Raul Mondesi, another player Kemp has been compared to, had a .573 OPS in April 1996, at age 25, with as many strikeouts (22) as hits. The rest of that year, his OPS was .882, followed by a .901 in 1997. While Mondesi never topped that ’97 season, he was still a productive player for five of the next six years. Andre Ethier, who has nothing on Kemp when it comes to fielding or baserunning or even chumminess with the press, has an OPS of .611 this month. They each have the same number of walks. Kemp has two homers to Ethier’s one. The main difference: Ethier is batting .228, Kemp .196. 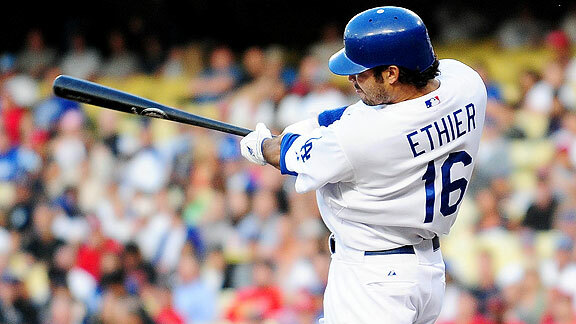 Woo-hoo for Ethier! Now, Ethier has the excuse (however justified it might be) that his pinkie might still be hurt. But that pinkie is no more a terminal condition than the slump Kemp is in. As for Kemp’s baserunning mistakes, like getting picked off Wednesday, the hysterical reactions are just tired. Jamey Carroll, Mark Sweeney, Juan Pierre, Luis Gonzalez — that stuff happens to everyone. James Loney, whom Joe Torre loves, made a mental error at the most critical moment of Sunday’s loss to New York. The only significance in Kemp’s baserunning mistakes is how they fuel the fire of his critics. As for the strikeouts, they’re always going to be part of his game, some days more than others. But the types of outs he makes hardly matter when seen as part of the big picture. Kemp’s fate is still to be determined, that’s for sure. Every day is a risk, with any player. Maybe he won’t be a superstar, maybe he’ll have to cut back on his basestealing, maybe he’ll have to move to right field (pushing Ethier to left). Maybe he’ll only just be (horrors!) good instead of great. But this much is certain: Selling low on a 25-year-old is rarely a good idea. And we’re talking about a center fielder with a career .817 OPS who, for all that has gone on, is still quite possibly entering the best years of his career, all before free agency. Hodges and Snider were near the end of their careers, but Drysdale was only 23. 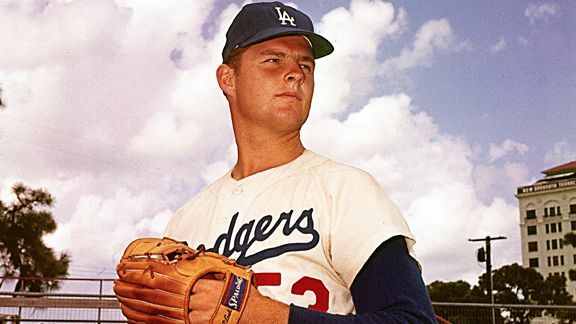 He was coming off a 3.46 ERA in the 1959 title season, but he ran into a slump, posting a 7.11 ERA in 31 2/3 innings over seven appearances (six starts), only one of them a quality start. Don Drysdale a Yankee. Gosh, it must’ve seemed like such a good idea to dump the kid at the time. All I need to find is one article calling him a head case or mental midget and my year will be complete. 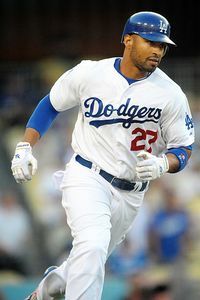 Matt Kemp will return to the Dodger starting lineup tonight, Joe Torre told Tony Jackson of ESPNLosAngeles.com. Ten managerial candidates to consider have been conveniently offered by John Perrotto of Baseball Prospectus. Mattingly is on the list, along with Alex Cora’s brother Joey, former Dodger Ron Roenicke and one-time Dodger candidate (before Paul DePodesta was fired) Torey Luvullo. Lucas May singled, doubled and homered twice for Albuquerque on Monday. James McDonald will return to the Albuquerque active roster Thursday, Jackson reports. I make the case for Hong-Chih Kuo’s inclusion on the National League All-Star Team at Rob Neyer’s Sweet Spot blog at ESPN.com. How do you solve a problem like George Sherrill? Ask Mike Petriello of Mike Scioscia’s Tragic Illness. Joe Posnanski is looking for your nominations for top sports books. 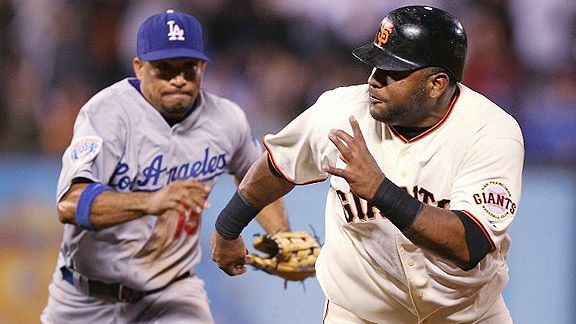 Rafael Furcal runs down Pablo Sandoval to complete a 9-3-6 double play, one of five San Francisco hit into. Casey Blake looks good rounding the bases on his eighth-inning homer. After a Los Angeles record-tying five double plays – including a huge 9-3-6 twin killing with runners on first and third and none out in the seventh – kept the team by the bay at bay for seven innings, Casey Blake hit an enormous two-run homer to break a 2-2 tie in the eighth inning, and the Dodger bullpen held on so that everyone could exhale after a long day of suffering with a 4-2 victory. Unsurprisingly, Chad Billingsley wobbled in the first inning of his first start in more than two weeks, but he ended up with a satisfactory six-inning outing, allowing two runs and seven baserunners on 98 pitches. Blake’s homer was the first the Dodgers have hit to give themselves a lead after the seventh inning since a Matt Kemp blast ended a scoreless tie against Arizona in the 10th inning on June 1. 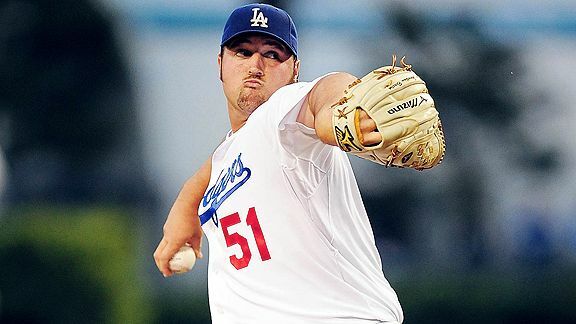 Hong-Chih Kuo allowed two baserunners in the ninth but closed it out for the Dodgers, who said that Jonathan Broxton will be rested until at least Wednesday. With the victory, the Dodgers moved back into second place in the National League West, four games behind San Diego, which lost to Colorado. Tony Jackson of ESPNLosAngeles has a story tonight on Matt Kemp’s ongoing benching. When asked whether Kemp would return to the lineup on Tuesday night against the Giants, Torre was non-committal. This rationale is just a ruse, considering that the Dodgers won the last game they played with Kemp starting and reaching base three times while making a fine running catch. Torre has decided to play the tough love card. Sounds like this one gets about a nine on the tension scale. Joe Torre’s primary skill set is at most one thing: He nurtures the clubhouse. I don’t know of anyone, even his stanuchest supporters, who touts Torre as a brilliant tactical manager. He has had moments of strategic inspiration, but they seem more than undermined by his justifiably maligned use of his pitching staff and other odd lineup and bench moves. Some of the criticism of Torre is overblown, but there’s a layer of truth to it that dates back to his Yankee days. And I say all this with no particular axe to grind. This is not a “Fire Joe Torre” post. I generally like Torre as a person. I don’t happen to think that Torre is much worse at game strategy than your garden-variety manager. But let’s face it: With Torre, you’re betting that the force of his even-keeled personality outweighs his flaws. He ‘s a bright man, but you’re not thinking he’s going to take you to the top because he’s a grandmaster chess player. Torre’s contract ends after this season. This past weekend, he told reporters that he would decide in September whether he wants to come back for more with the Dodgers, although even then, there’s a question of how much the McCourt ownership will want to pay him for the privilege — or whether anyone up top will even be able to focus on the question. The McCourt divorce trial is currently scheduled to begin August 30. What kind of negotiations are there going to be with Torre during that time? If the Dodgers are in fourth place, will there be any negotiations at all? Or is it all in general manager Ned Colletti’s hands? 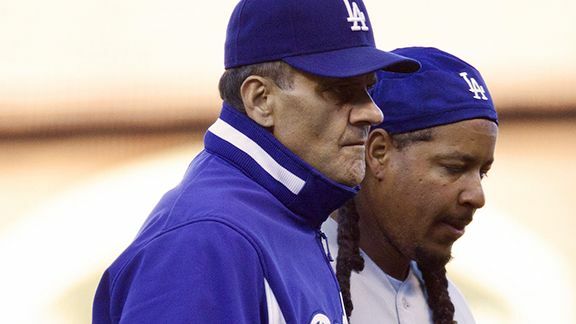 It’s possible that the Dodgers will take decide that, with all their other concerns heading into 2011, they’d like stability in the managerial chair and will quickly give Torre what he wants to stay. If the Dodgers bounce back to the top of the division, I’d almost be willing to bet on it. The only other possibility on the horizon is that Don Mattingly will be the Dodger manager next season. It has been spelled out in no uncertain terms that Mattingly is the heir apparent, and if the Dodgers fall out of the race, Mattingly could be named the 2011 Dodger manager before the 2010 season ends. This, my friends, gives me the willies. Mattingly is Joe Torre without Joe Torre’s personality or experience. 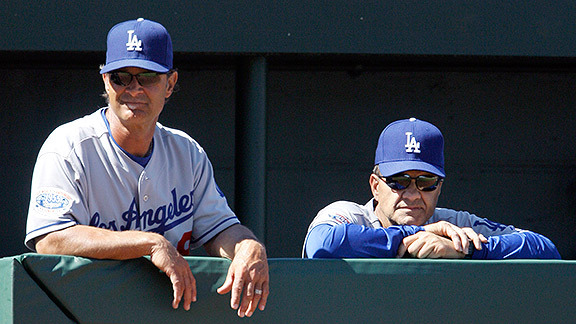 Mattingly has never managed a regular season baseball game and has never coached for anyone except Torre. Obviously, Mattingly’s baseball knowledge is not limited to his time by Torre’s side, but surely his tactics are going to be heavily influenced by Torre. And that, while not being the worst thing in the world, is not anything to be excited about. Then you have to ask yourself, is Mattingly the type of person who can nurture a clubhouse, who can make a team better when the game isn’t going on? I don’t know Mattingly at all, so I’m not qualified to answer that question. But my concern is that Mattingly is being handed this job not because of any actual qualifications, but because he’s perceived (hoped) to be Torre II. He’ll continue Torre’s winning ways just by having soaked up his innate Torreness. If it were that simple, I don’t think Laker fans would be concerned about Phil Jackson leaving. As a counter-example, Tim Wallach has both coached on the major-league level and managed on the minor-league level for the Dodgers. He was named Pacific Coast League Manager of the Year in 2009. This season, he has been doing a barefoot walk across the coals, because the Dodgers’ pitching problems have absolutely burned their top affiliate in Albuquerque. In this season alone, Wallach has had to use 17 starting pitchers this season in 74 games. He has very little in the way of top-rated AAA prospects right now. He has had to work without the safety net of a Joe Torre and then some. As the Dodgers prepare to bid farewell to Torre, this year, next year or whenever, they have some responsibilities, some explicit, some implicit. For one thing, Major League Baseball requires the Dodgers to interview at least one minority candidate for the position. Whether you believe in this rule or not, I’d argue that the Dodgers should not make this interview a token activity, but rather at least one of a number of serious interviews, a wider exploration into whether anyone is better than Mattingly for the job. Clearly, Mattingly has impressed people in the organization, but has he done so in ways that really matter? If they pause and step back, are there not potential managers out there who would be more compelling? By writing this piece, I risk giving this decision more importance than it deserves. The talent on the field is still more important than the talent in the dugout, and a hire of Mattingly isn’t going to ruin the Dodgers. Mattingly is not Torre, and given what happened Sunday, some might say that’s a good thing. But the Dodgers should ask themselves whether a Mattingly hire would bring continuity in all the wrong places. Jonathan Broxton, shown here Saturday when he was preserving a Dodger victory over the defending World Series champions on national television. I have to admit that thankfully, the tirade that comes from so many Dodger fans during the rare collapse by Jonathan Broxton has reached the point of amusing me more than upsetting me. Prior to Sunday’s game, Broxton had allowed one earned run in his previous 23 games (0.39 ERA) with no blown saves. In 33 games this season, he had allowed three earned runs and three inherited runs to score. He had surrendered two leads all year. He had over 50 percent more strikeouts than baserunners allowed. But then the people come out and say none of this matters, because Broxton can’t perform on the national stage when it counts. Even though he had performed on the national stage in an identical situation one night before. Really, you just have to laugh. People say I’m too quick to defend Broxton, but really, it’s just so easy to do it. Where are all these other closers who never have a bad game? Where are they? Name one closer in baseball besides Rivera who is better than Broxton. 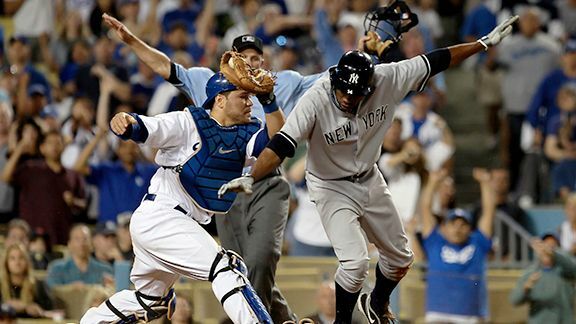 Curtis Granderson scores the tying run ahead of Russell Martin’s tag in the ninth inning tonight. That line comes courtesy of Dodger Thoughts commenter BHSportsGuy, and that’s tonight’s 8-6 Dodger loss. The Dodgers, who for eight innings had answered so many of the snickers about their recent peformance, who were three outs away from two convincing victories over the Yankees after a narrow loss, find once again that the joke’s on them. The headline was going to be, “Dodgers’ triumph over Yankees draped in bunting.” The team hit the motherload with three successful bunts in a three-run third inning, two of which were thrown away by Yankees starter Andy Pettitte. (The Dodgers tied a team record tonight with six combined sacrifice hits and sacrifice flies.) Two more runs followed in the fourth, while Clayton Kershaw looked in complete control on the mound, walking no batters for the first time in his career and allowing what seemed to be a meaningless two-run homer by Alex Rodriguez in the sixth inning. Eight innings in which the Dodgers executed flawlessly – capped by an adrenalin-rushing 3-6 double play started by James Loney – eight innings in which the Yankees looked like the pretenders, all gone as the leader of the Dodger bullpen, Jonathan Broxton, couldn’t protect a four-run lead in the ninth. I think even most of Broxton’s detractors would agree that tonight’s career-high 48-pitch outing, in which he allowed more earned runs than he had all season, was more about his lack of stuff than anything else. Coming off a four-out appearance Saturday, Broxton just didn’t have it, and the Yankees just ate him up like vultures. It certainly wasn’t that Broxton couldn’t do the job against an American League team on national television, considering that he had done so 25 hours earlier. But it surely was an agonizing demise, painful to endure, good times bleeding into excruciation. The 10th inning then completed George Sherrill’s utter fall from grace, as he was brought in specifically to face left-handed Robinson Cano (who it should be noted entered the game slugging .596 against lefties) and gave up a two-out, two-run home run for the Yankees’ first lead. If you’re angry, you’re not alone. The Dodgers have boiled over, with mild-mannered Garret Anderson and frustrated Russell Martin both ejected – the team’s fourth ejections in the past four games, two by Martin. (Anderson must have said something interesting, because he was about 30 feet away from home-plate umpire Chris Guccione and running toward the dugout when he was tossed). So more than one question has been answered this week: The Dodgers do care. They also aren’t, by any stretch, the only team capable of looking bad in the field. They can play this game. They have heart, and they have talent. But this question remains: When are they going to get some wins? Andre Ethier has as many home runs with at least two runners on base in 2010 as the rest of the Dodgers combined. 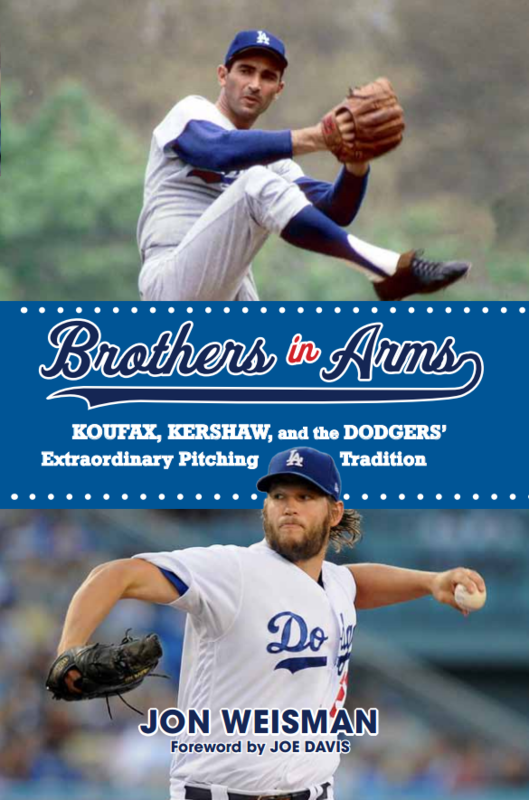 Yankees at Dodgers, 5:10 p.m.
You know what I look forward to seeing? The Dodgers breaking open a close game or rallying with a three-run home run. But in 74 games this year, the Dodgers have only eight three-run homers, along with two grand slams by Andre Ethier. That total comes in 443 plate appearances with at least two runners on base. The Dodgers were on a pretty good pace until shortly before Ethier’s pinkie injury. In nearly seven weeks since May 11, the Dodgers have two three-run home runs. Manny Ramirez is 16 for 31 (.516) with three doubles and six walks with at least two runners on base, but doesn’t have a homer this year in those situations. James Loney, who broke the 50 RBI barrier Saturday, is second on the team with two three-run homers. He is 21 for 53 (.396) with four doubles, two homers and four walks with at least two runners on base. Here are the 10 three- or four-run home runs. April 13: Andre Ethier, ahead 6-2 in the sixth. April 16: Andre Ethier (grand slam), ahead 3-0 in the second. April 20: Matt Kemp, down 9-6 in the eighth. April 30: James Loney, ahead 2-1 in the third. May 1: Andre Ethier, down 1-0 in the third. May 4: James Loney, down 11-3 in the eighth. 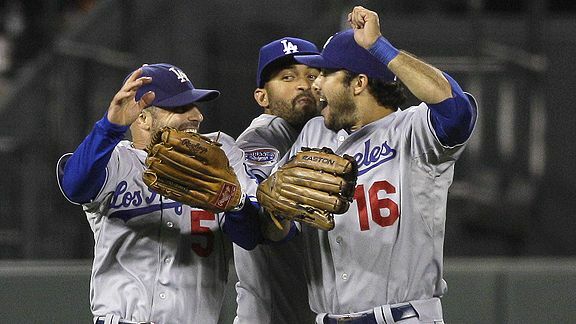 May 6: Andre Ethier (grand slam), tied 3-3 in the ninth. May 11: Russell Martin, ahead 4-3 in the eighth. June 7: Blake DeWitt, ahead 7-1 in the fifth. June 16: Andre Ethier, ahead 2-0 in the sixth. The Dodgers are actually pretty decent at keeping rallies going. But sometimes, you just want to see them hit the heights.